These camping charms of a trailer, campfire, canoe and more will make it a lot easier and more fun to find your glass at gatherings. Charms are a popular party accessory and add a unique feature to your wine party that your guests can select and enjoy, knowing the wine glass is theirs for the evening. Personalize your event with Ripitfrog charms that come in a variety of themes for men and women alike. 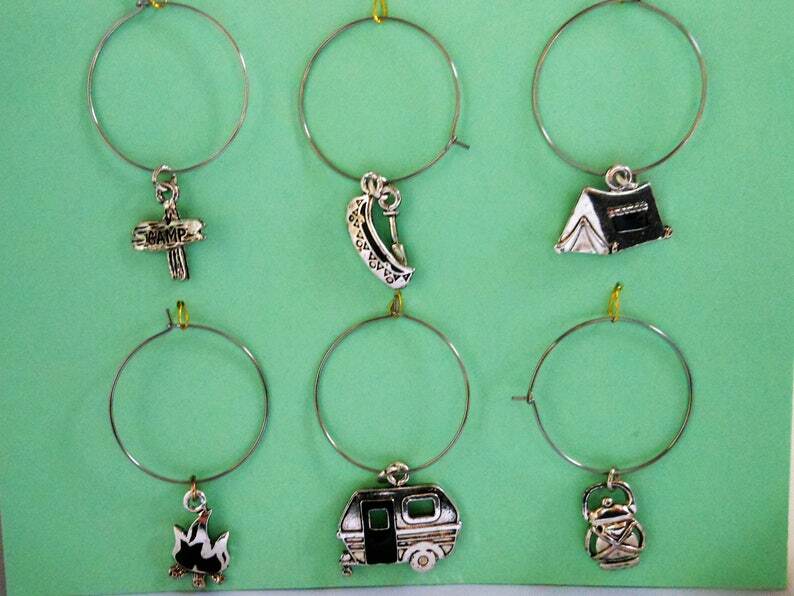 Check out the charms shown in the Ripitfrog shop that include themes for contractors, cowboys, camping, sports, and more. Enjoy these holiday wine charms at your next party. Unhook and place around the stem of your glass. Caution: Not intended for children 13 years and under. Do not place items in mouth or ingest. Thanks for stopping by and supporting small businesses. Thanks for the fast shipping on this unique handmade wine bag; perfume for the recipient!